After a lot of searching this is the only 60cm wide fridge freezer with highest usable capacity available. It is A++ as well, energy efficient. Never bought from Mychoice before, they have very friendly customer care online chat, who were nice enough to rectify their website when I told them the 5% discount voucher was not working. Same space outside, More space inside! The new Samsung G Series RL60GZEIH fridge freezer maximises your storage space by offering increased capacity, whilst keeping the same dimensions on the outside. Adding to this extra capacity is a huge performance. It has A++ energy rating, which saves up to 45% in energy costs compared to A rated fridge freezers, an innovative Fresh Room Zone, stage LED lighting, and for added luxury, an EZ Open Door Handle. This is definitely a premium experience for the home kitchen. Besides keeping your food fresh, nutritious and looking delicious, no-frost technology means never having to worry about icy build-ups or defrosting your refrigerator again, saving you tons of time. So just relax and let your fridge freezer do the work for you. The Holiday Mode feature has been designed specifically to keep your entire fridge running efficiently while you're away from home. This intelligent feature turns off the fridge while keeping the freezer working. So enjoy your time away from home without worrying about your energy bill or food going bad. The Samsung RL60GZEIH G Series 2.1m Fridge Freezer features Multi Flow Cooling, 3 tempered glass shelves, 4 star freezer rating and Blue LED display. 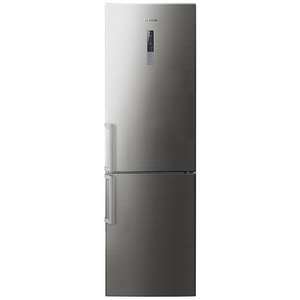 More space for a smarter way of life with the Samsung RL60GZEIH G Series 2.1m Fridge Freezer. People voting cold obviously don't realise what a good deal this is for this model. Yes it is an expensive fridge freezer, but given its size, there is no competition to it. Its got 5 years warranty thrown in as well. hitting both of those spec levels means > £500 for a Bosch/Siemens/Samsung/Miele level brand, unless someone knows better? Cheers to the OP I was sitting reading reviews and watching videos on this just before you posted it. Every penny helps! Would have gone for this if it was under 200cm as it won't fit the recess that my current fridge freezer is in due to the height. Got it delivered and installed yesterday. Had a small dent on the side, but I still accepted it. Looks very good and was very quick to reach -18C temperature. Plenty of space inside the fridge too!